Smeagol the Hobbit murdered his own cousin in order to take possession of the infamous Ring of Power. But it very quickly corrupted him to the point where he turned into the hideous creature you see in the movie. He eventually lost the Ring, but he never lost his desire to get it back—even though he knew firsthand how destructive it was. Here we see the effects of original sin (something I’m sure Tolkien had in mind when he wrote the story). Adam and Eve sinned because they wanted power: the power to be like God; the power to live by their own rules; the power to manipulate reality and even others for their own selfish ends. Smeagol was consumed by that same desire—he was enthralled with it—which is why he calls the Ring his “Precious” throughout the film. Finally he has his chance to get his Precious back, when he meets up with Frodo and Sam, two Hobbits who are taking the Ring to Mordor and Mt. Doom (which is the only place where it can be destroyed). Smeagol volunteers to be their guide for the journey. He pretends that he wants to help, but his real intention is to kill them and steal back the Ring. But it never happens. Even when it seems like he’s left the scene for good, he hasn’t. And, as far as I’m concerned, that’s the most upsetting part of an otherwise magnificent film. Which leads to the obvious question: Why? Why was this fictional character so annoying to me? 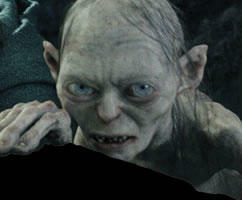 What was it about Smeagol that was so aggravating? I thought about that when the movie was over, and the answer finally came to me in a moment of insight: I was upset because I didn’t want to spend 3 hours with Smeagol in a movie theater, since I already spend so much time with him every day! Yes, you heard me correctly. I spend lots of time with Smeagol each and every day. And so do you! So does every human person. Smeagol represents the desire to be like God; the desire to live by our own rules; the desire to control reality—especially other people. And that’s a constant temptation we all must fight against. Because if we don’t, we—and others—suffer the consequences. Think of Saddam Hussein. He’s a perfect example of the phenomenon: a man consumed with the desire for power. Interestingly enough, just like Smeagol, this evil desire led him to murder. And not just one person: it led him to murder thousands of people—his own people. In a sense you could say that Saddam Hussein was determined to have—and to keep—his own version of “the Ring” at any cost. As we were told in today’s Gospel, the magi did not return to him after they visited the baby Jesus in Bethlehem. They went back to their own country by another route. And how did Herod respond to this turn of events? He murdered all the male children 2 years of age and under in Bethlehem and the surrounding towns! Just like Saddam Hussein, Herod feared losing his personal version of “the Ring,” and it led him to kill the innocent. And this, unfortunately, was not an isolated incident in his life: for Herod this was “standard operating procedure.” He allowed the Smeagol inside him to have such a control over his mind and heart, that he killed over half of his ten wives and many of his own children. All because he thought they wanted to steal his throne—his “Ring!” Caesar Augustus once said that it was safer to be Herod’s pig than Herod’s son—and the sad thing is, he was probably right! Now we may not go to the extremes of a Saddam Hussein or a King Herod (I certainly hope we don’t), but the desire for power can corrupt all of us in much more subtle ways, if we’re not careful and vigilant. For example, whenever we disobey legitimate authority—whether that authority is civil or religious—we are allowing the Smeagol in us to lead us into sin. And think how often that happens! Think of how often people disobey the Church in matters of faith and morals! Whenever an employer treats his workers unfairly, he’s allowing the Smeagol within to do his dirty work. You teenagers have conflicts with your parents. You have those conflicts for many different reasons, but in certain cases it’s because the Smeagol inside you wants the Ring of Power! That’s what’s really going on. You want your independence now—right away—on your terms. You want a power over your life that you’re not quite ready for yet—and that leads to World War III with mom and dad. Whenever we try to lay a “guilt trip” on someone because they don’t pay enough attention to us, or they don’t do what we want them to do, we are allowing the Smeagol inside us to undermine our interpersonal relationships! Yes, my brothers and sisters, it can be as subtle as that! The bottom line is this: Smeagol is everywhere! He’s as prevalent in our daily lives, as he was in the Lord of the Rings movie! Keep that in mind when you go to see the film. Only by the power of Jesus Christ can we be rid of him! But that’s a power we must seek every day! Thus we need a strong personal prayer life, the support of Christian friends; and we need to receive the sacraments often—especially the Eucharist and Confession! As I said at the beginning of my homily, I had that thought in my mind when I was inside the movie theater the other day. But, if I want to be a saint, I know I can’t leave it there! I have to carry that thought—I have to carry that attitude—with me into my daily life. I have to understand the subtleties of the Smeagol within, and I have to seek God’s grace in order to push him away whenever he tries to control me. Pray for me, that I will do that. And I promise to pray for all of you, that you will do the same. Together—by the grace of God—let’s get rid of Smeagol!